There are so many truly great American made vehicles throughout automotive history. And thus, going out of your way to *choose* or set up a “best of all time” list is very arbitrary. A more scholarly type would argue that the Model T is the single most important vehicle in history, since it brought cars to the public for the very 1st time. Others would choose one of the Corvettes’s and hold that as a sentiment to quintessential American performance. Or you could point out how the Ford F-150 is America’s go-to workhorse and has been for decades now. With all of these distinctions in the back of our minds here at endurance, we have compile SEVEN examples of American automobiles that stand out in their respective segments! How do you choose the best Jeep when they have so much in common? Actually that’s a pretty easy answer: the Scrambler was the choice here because it has a uniquely long wheelbase for greater stability than other Jeeps and it’s especially noticeable on the highway. Plus it offers extra space in back making it the quintessential pickup hybrid we wish Jeep would make again. And it looks cool too. How American is it? President Ronald Reagan famously kept one around at his ranch. 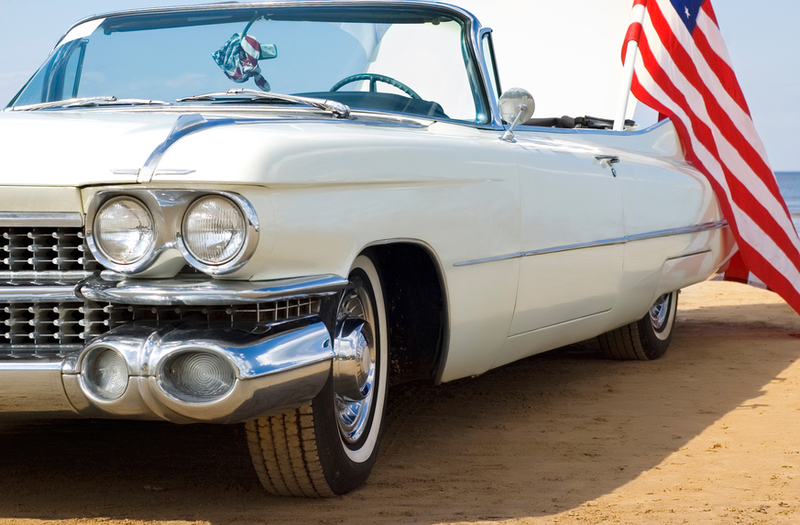 The classic Cadillacs were known for their streamlined designs, engineering and innovation. It’s hard to pick just one and most would point to the 1959 Coupe DeVille but we at Endurance are not everybody: we’re going with the ‘57 Eldorado Brougham as the symbol of everything great and unique about Cadillac. The beautiful two-door hardtop hits that right balance of refined and flamboyant but it’s the state of the art engineering that pushes it into legendary status. This car was one of the early adopters of self-leveling suspension, power windows, and even power seats with memory settings in the ’50s. It even has unparalleled luxury like a glove box cocktail kit. There are so many great Mustangs to choose to represent. So we looked into our hearts and decided that the original Shelby GT350, turned the Mustang from what was once referred to as a “secretary’s car” into a classic and coveted American performance vehicle. Back in the day you could even could rent them in GT350-H guise and test your might on the racetrack. The GT350 was once the fastest Mustang you could buy at the time, it was the granddaddy of a new breed of performance car. Picking the best Camaro isn’t as easy as it is fun and we’re looking forward to the comments in rebuttal to our choice. We at Endurance, are going with the current 1LE now before you gasp all dramatically it is not because it’s the newest. It’s the innovative performance that helps to elevate the Camaro up towards the international performance vehicle scene. It’s the only Camaro that is literally world-class, and that’s a huge deal for Chevy and Camaros. Let’s go back in time to some of the early automobiles: in the 1930s, a Duesenberg Model J could hit 60mph in around eight seconds and a top speed of over 130. That was mind blowing for that era and some of today’s cars struggle to do that, decades later. The approximate price of a Model J was around $30,000, that’s over $400,000 in today’s dollars, but that doesn’t even take into account how expensive it was for 30s drivers. Sadly, the car’s technical and engineering innovation couldn’t overcome the difficulties of the Great Depression. We had to pick at least one pickup truck for this list, but you may be scratching your head and wondering why this one from 25-years ago. What makes the Syclone the best is that is a 280hp, turbo V6 sports truck. It’s a rare breed. It was even equipped with an all-wheel drive back when next to no new vehicles had all-wheel drive. The magazine Car and Driver had a pretty famous piece where they raced one in a against a contemporary Ferrari — and the Syclone won. Now this was not the first sports truck, and it would never be as famous as the Ford Lightning but this is without a doubt an impressive piece of machinery worth remembering. You didn’t think we’d not have a Corvette on our list did you? Ask any gearhead and they’ll have different answers but for us at Endurance, the second-generation Corvette is where the car went from a truly important performance vehicle in automotive history and culture. However, it was not until the year 1967, where three little digits on the order sheet set this car ahead of the curb: L88. GM never went out of their way to encourage buyers to tick the box next to that mark, since that meant giving you a beastly 427cid engine that really was never meant for the streets of the 60s. “Officially” rated at 430hp most estimates have the actual output closer to 550hp. Simply put, that means the car is ridiculously fast by today’s standards, inconceivable back then, and since only 20 were made, it’s really rare. The car sold for $3.85 million at Barrett-Jackson in 2014. Whoosh! So there you have it: Good old Fashioned American engineering at its finest! If you believe we missed a few cars or want to argue with our picks, comment and let us know!